I found these ads in the Real Estate Record and Guide. 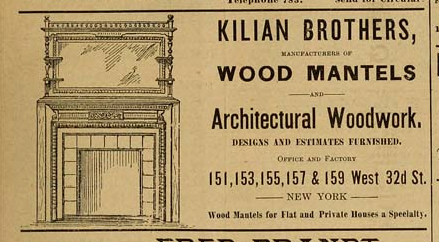 A quick check of some of my neighbors fireplaces, and it seems that the Kilians’ were the go-to purveyors of fireplace surrounds of the late 1880s and early to mid 1890s. Update: they are keeping the fireplaces. Yey! Not only that, they have an intact one in the rear parlor (meaning it has the mirror topper, as pictured above). The demo crew was kind enough to let me peek inside. Befriending demo crews is becoming a skill I get to practice quite a bit as of late.